De Re Militari, begun in 1992, is the Society for the Study of Medieval Military History. Here we host many primary sources, articles, dissertations, and resources for the study of military actions, technology, and topics from the fall of Rome to early seventeenth century. 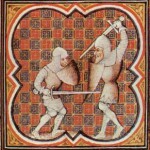 We also have an active online Book Reviews section.We are the principle online source for scholarly information about warfare in the Middle Ages. Every year, and DRM sponsors lectures at the International Congress for Medieval Studies (Kalamazoo, MI), the International Medieval Congress (Leeds, UK), and the Society for Military History (peripatetic). Since 2003, DRM has also published the annual Journal of Medieval Military History (JMMH), published by Boydell & Brewer, which members receive at a substantial discount off the list price. Please note that in Feb. 2012, the DRM site was infected with a malware attack. We have rebuilt it, and continue to do so, but there are still a few things left to go. If you know of things that used to be here but aren’t able to be found, please let us know. Thank you for your patience.